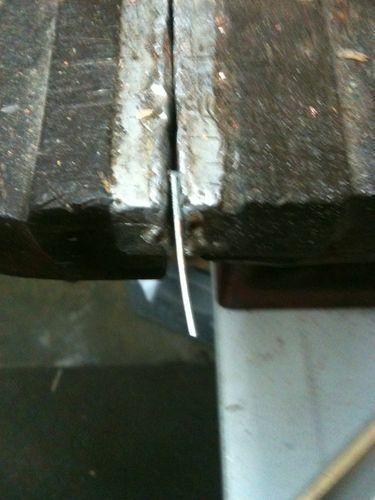 As far as the splinter goes, it’s been my experience that they hurt more coming out than going in. Right? Hell of a learning experience. Been there done that and it will defiantly get your attention!!! I built the sled that Jerry Bennett talked about and he was even kind enough to us vets he sent us 4 of his templetes. I am told by someone I know that they built a sled like his to work on his Bandsaw also. I think it turned out cool looking. All part of woodworking unfortunately I get them all the time (not as bits as the Titanic one of yours) and they are so painful I have to stop work and remove them beacause they are so distracting. I managed to brad nail my finger one day, dont ask how as to this day even I dont know, but it happened. Almost went right through, look closely and you can see the skin bulging opposite the entry point. Didnt go to the hospital, too much woodwork to do and didnt want to waste half a day or more. Nice work on the bowl. That must of been a hands on experience. Wow! 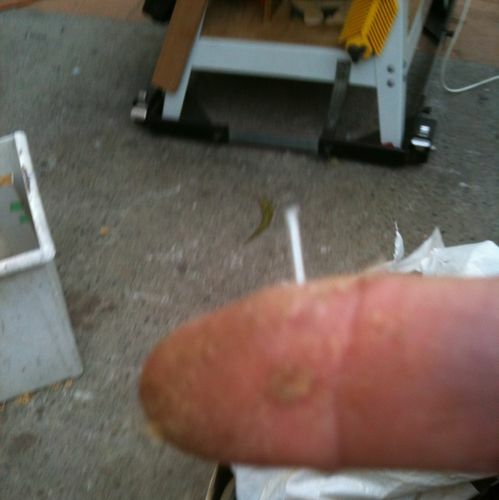 That’s a bad splinter for sure. However, the bowl sure did turn out beautifully. Nice work! Still a doozy though! Good thing it was shallow. Let me guess, you were feeling the lip of the bowl while it was spinning? As a token bonus, it looks like you saved yourself crawling on the floor looking for that piece. Pull it out an glue it back on! BTW, I really like the pattern you created with those segments. Did you create the circles in one tall cylinder then cut them to thickness or did you make them individually? Beautiful bowl … worth the “pain”!